The 35 year old successful tennis player defeated Spanish racket Rafael Nadal in the Miami Open 2017 tournament. There was the new Rolex Sky-Dweller on the tennis player's wrist who became the champion again in Miami after 11 years. World No. 6 Roger Federer and World No. 7 Rafael Nadal faced men's singles final in Miami. Roger Federer was the one who left happy from the two. Federer won three major tournaments this year. Federer, who has been a brand ambassador for Rolex many years, wore the new Rolex Sky-Dweller introduced at Baselworld 2017 at the award ceremony. 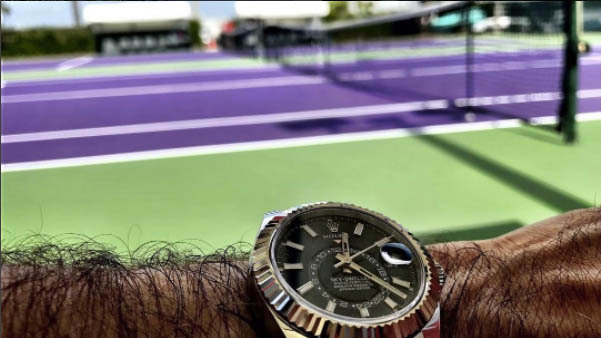 The famous tennis player also shared a photo of his new watch at Instagram before the match.